Fundamentals of SCADA communications 47 Protocol specifics This section reviews the Modbus protocol in detail and is broken down into the following sections: • Message format • Synchronization • Memory location • Function codes • Exception responses Message format A transaction consists of a single request from the host to a specific secondary device and a single response from that device back to the host. Both of these messages are formatted as Modbus message frames. Each such message frame consists of a series of bytes grouped into four fields as described in the following paragraphs. Note that each of these bytes indicated here are in Hex format (not ASCII). Address Field 1 Byte Function Field DATA Data Field Error Check Field 1 Byte Variable 2 Bytes Figure 2.26 Format of Modbus message frame The first field in each message frame is the address field, which consists of a single byte of information. In request frames, this byte identifies the controller to which the request is being directed. The resulting response frame begins with the address of the responding device. Each slave can have an address field between 1 and 247, although practical limitations will limit the maximum number of slaves. A typical Modbus installation will have one master and two or three slaves. The second field in each message is the function field, which also consists of a single byte of information. In a host request, this byte identifies the function that the target PLC is to perform. If the target PLC is able to perform the requested function, the function field of its response will echo that of the original request. Otherwise, the function field of the request will be echoed with its most-significant bit set to one, thus signaling an exception response. Table 2.2 summarizes the typical functions used. The third field in a message frame is the data field, which varies in length according to which function is specified in the function field. In a host request, this field contains information the PLC may need to complete the requested function. In a PLC response, this field contains any data requested by that host. The last two bytes in a message frame comprise the error-check field. The numeric value of this field is calculated by performing a cyclic redundancy check (CRC-16) on the message frame. This error checking assures that devices do not react to messages that may have been changed during transmission. 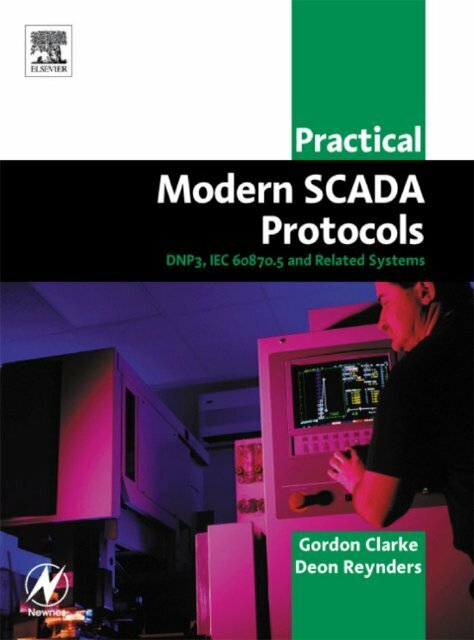 48 Practical Modern SCADA Protocols: DNP3, 60870.5 and Related Systems Synchronization In order to achieve reliable communication, the reception of a message must be synchronized with its transmission. In other words, the receiving device must be able to identify the start of a new message frame. Under the Modbus RTU protocol, frame synchronization is established by limiting the idle time between successive characters within a message frame. If three character times (approximately three milliseconds) elapse without the receiving device detecting a new character, the pending message will be flushed. The next byte will then be interpreted as the address field of a new message line. Memory notation The memory notation allows for four different data types: coils, discrete inputs, input registers and holding registers. Register variables consist of two bytes, while coils and discrete inputs are single bytes. Each function references only one type of data. This allows message-frame memory references to be expressed as offsets relative to the lowest possible address for that data type. For example, holding register 40001 is referenced as 0000. 110V AC Coil Digital Output Discrete Digital Input 5V DC Master Node 16 Bit Input Register Slave Node 16 Bit Output Register ADC DAC 4-20mA Analog Input 4-20mA Analog Output Figure 2.27 Diagram illustrating Modbus data types Table 2.2 lists the address range and offsets for these four data types, as well as the function codes which apply to each. The diagram above also gives an easy reference to the Modbus data types. Function codes Each request frame contains a function code that defines the action expected for the target controller. The meaning of the request data fields is dependent on the function code specified. Page 8 and 9: Contents vii 12.6 Frame reception . Page 52 and 53: 2.7.6 Synchronous communications 2. Appendix D: Practicals 473 3.1.1.1.